Pontiac Solstice Forum > General Solstice Discussion > General Solstice Discussion > Curse you, Texas weather! I know I'm late to this party, can I ask a couple of questions? Did the hail damage the top? The windshield? Instead of paying someone to remove the dents, would it be less expensive to just replace the hood and deck lid? The cost of removing (or living with) the dents on the quarter panels alone may be affordable. Yeah, I thought about just replacing parts. Top is fine. Hood and trunk lid (or bonnet and boot lid, for my British friends) are the worst hit. I've found black parts, but no silver yet. Definitely keeping that open as an option. There was a really nice GXP listed on the Facebook group the other day for $7200. Braces, tuned, something like 50k miles. I PM’d it to you earlier. In Texas, you don't have to report hail and get a salvage title. But that GXP in Vegas sure is nice! What color is the GXP in Vegas? I looked at the insurance settlement again and noticed that they had all the options unchecked on my Sol. Notified them and they made adjustments and have now offered me $8984 ... that's more than I paid for it back in October! After a $250 deductible, that would $8734. The "keep it" payout would be $6366. Thought about taking the payout and getting another, but I'm keeping it. Now I just need to locate a hood and deck lid and then have my PDR company take care of the rest. Between this payout and more for 2 of my other vehicles, I'll have plenty for repairs, extras, deductible for the roof and then some. Lots of NOS deck lids in Michigan, but they're $250 and shipping starts at $100 for the crate and all that jazz. 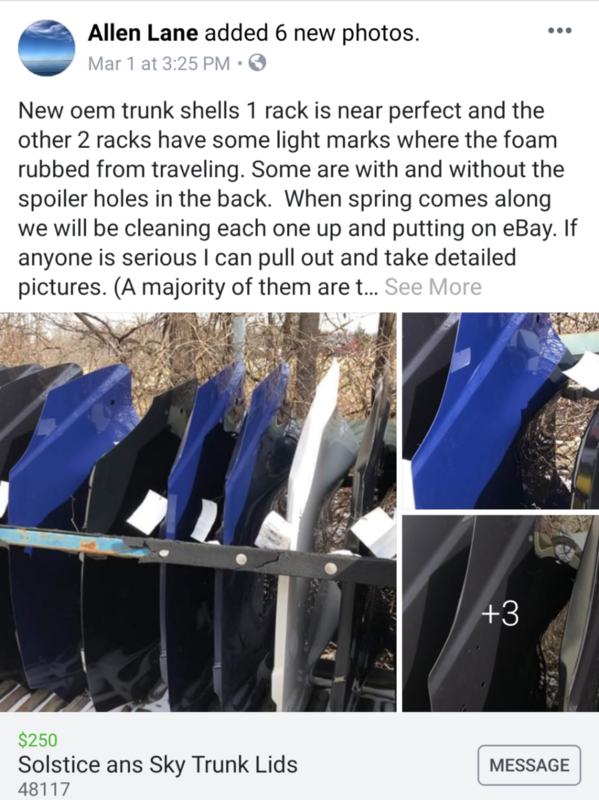 Plus they don't have any of the weatherstripping and may or may not have the spoiler/antenna holes you need. In the long run, you're probably better off finding something local that's more ready to bolt on. My dad's got a dark gray lid for sale in TN, however you're probably better off buying one of the new ones that were previously mentioned since you can probably get one already painted your cool silver color (the fastest color). If interested in my dad's then feel free to email him (Darryl) at [email protected]. Checkout this place Al_c. autopartsfair.com Ive seen some in Dallas.